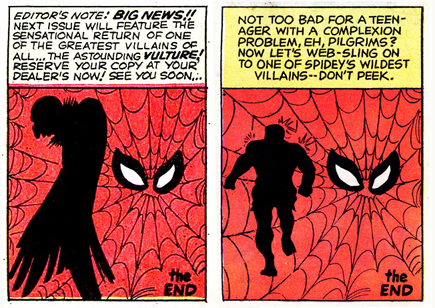 Marvel Special Edition: The Spectacular Spider-Man #1 (1975) | 'TAIN'T THE MEAT… IT'S THE HUMANITY! I’ve a great fondness for Marvel’s reprint collections from the 1970’s and I’ve already written about their Treasury Editions that ran from 1974 to 1981. Released when reprinted comics were a rarity, these oversized collections were great favourites of mine when I was a kid, as they gave me the opportunity to re-read some classic comic book stories. But Marvel also published a range of reprints under their Marvel Special Edition‘s banner so I’m also going to take a closer look at some of those. This time it’s The Spectacular Spider-Man Special Edition #1. Priced at $1.50 (or 50p here in the UK) Marvel’s Special Editions were big! Measuring an impressive 10 x 13.5 inches, printed in full colour and running in page length from 80 and 100 pages, they looked and felt impressive. And, with a few caveats, The Spectacular Spider-Man Special Edition #1 is no exception. 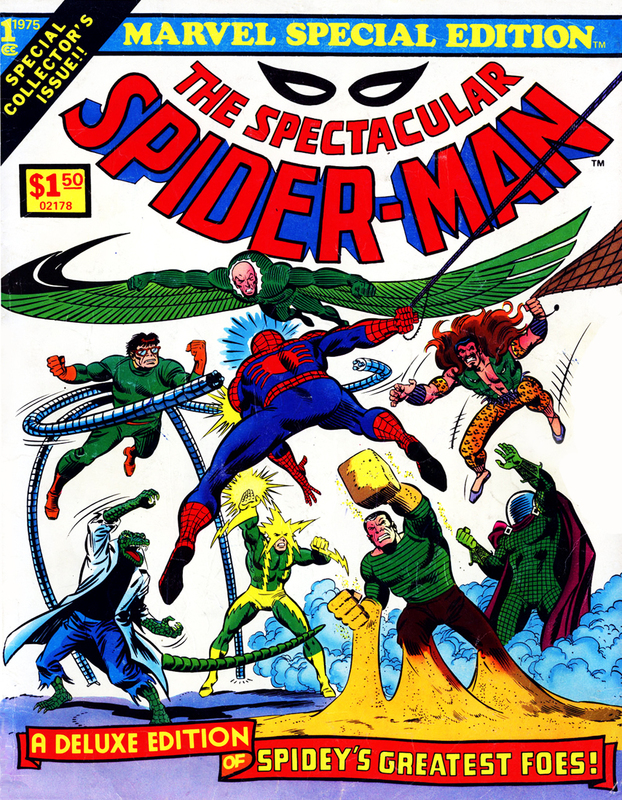 Published in June 1975 this collection ran to 84 pages and reprinted three stories from The Amazing Spider-Man comic: “The Sinister Six!”, originally published in the 1964 Annual; “Face-to-Face with… The Lizard!”, from issue #6, November 1964 and “The Molten Man Regrets…!” from issue #35, April 1966. 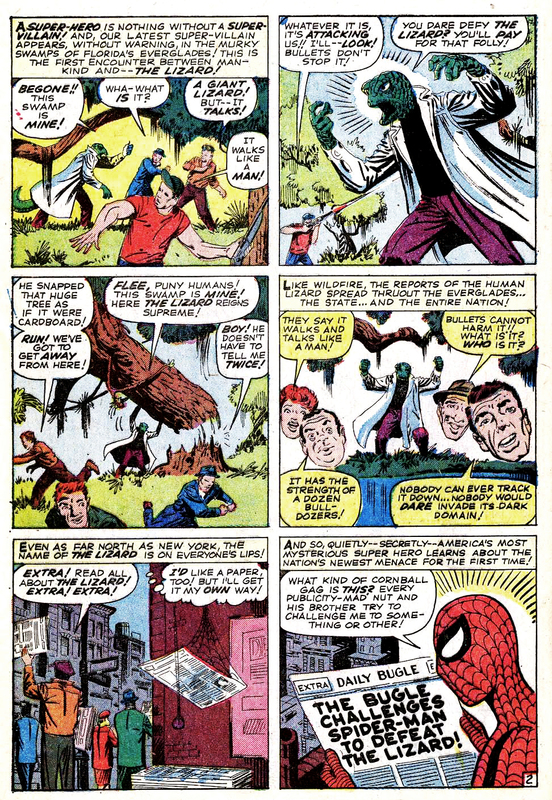 All three stories were from writer Stan Lee and artist Steve Ditko’s legendary run on the title in the 1960’s. 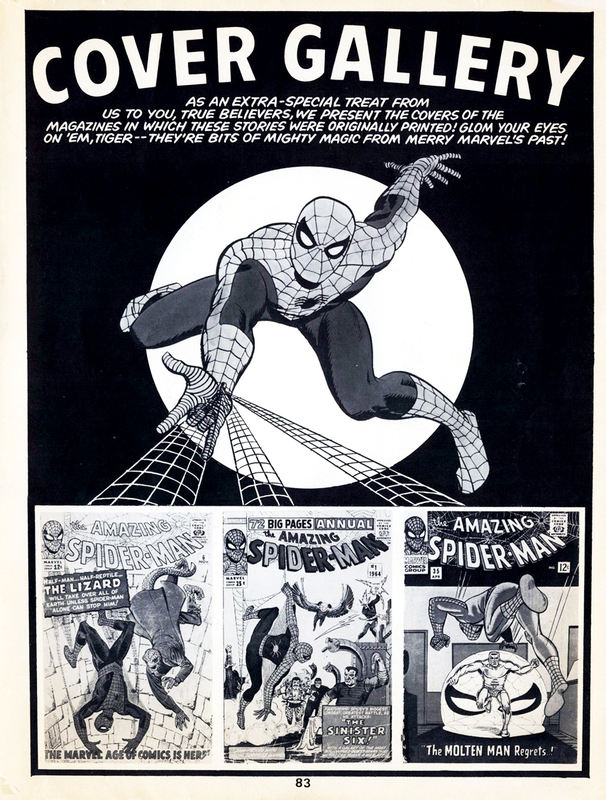 This collection also features an introduction by Lee, a double-page splash by John Romita starring Peter Parker and the comic’s cast of characters (this was mistakenly labelled as a pin-up of The Sinister Six on the contents page) and a cover gallery. The collection also sports a eye-catching and novel front and back cover by Romita. Although the three stories reprinted here are classics, and reading them in the Special Edition’s larger size was a treat, the shape of the actual collection itself created some reproduction problems. Fitting the stories into the Special Edition’s more squarer proportions required the cropping of some of the original panels; thankfully the cropping is quite subtle and I suspect many reader’s wouldn’t have noticed the difference. What is more noticeable though is the removal of some panels, and even whole pages from two of the stories, a decision that surely would have upset the purists. 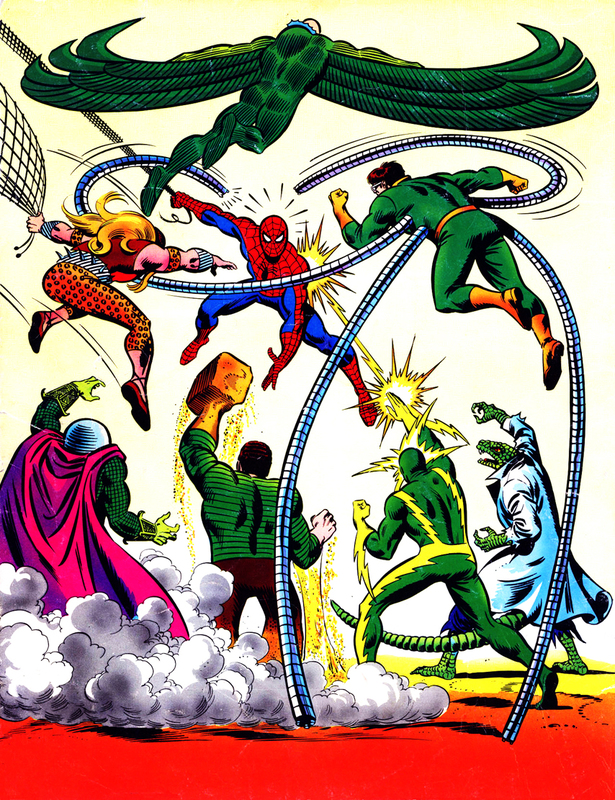 The Sinister Six story from the 1964 Annual originally ran to 41 pages, so reprinting it in its entirety would only leave room for one other story in this collection. So five pages from this story have been removed, including panels featuring Peter Parker’s college friends, a brief fight with The Human Torch and a full-page splash of Spider-Man defeating The Vulture. A page from The Molten Man story was also removed. 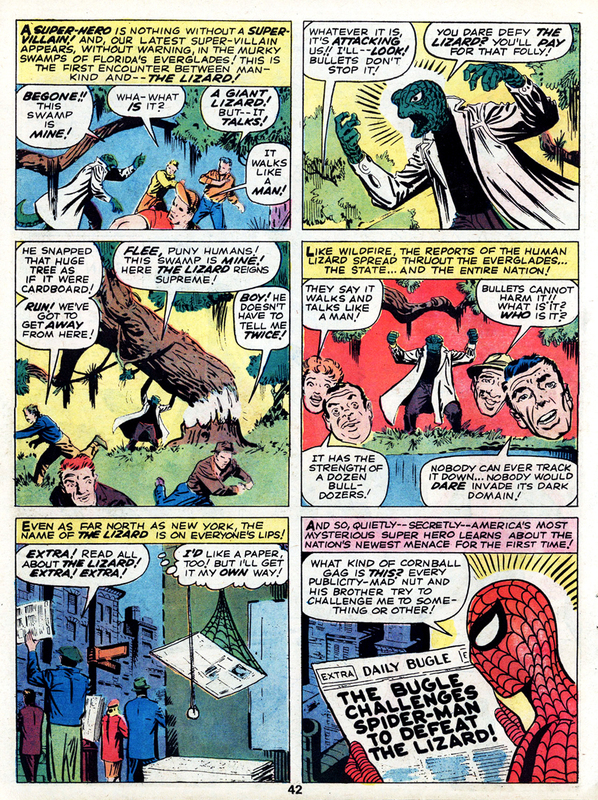 Thankfully the other story, “Face-to-Face with… The Lizard!” remains intact apart from the last panel which has been altered – a silhouette of The Vulture has been replaced with one of The Molten Man, with new text written in the blurb above. The only other inconsistency with the original stories is that both The Vulture and The Molten Man stories have been recoloured. Despite being a great fan of Marvel’s Treasury’s and Special Editions – I’m still not sure exactly what the distinction was between the two as they’re both identical in format – the removal of panels and pages from the 1964 Annual and Molten Man stories stop me from enjoying this collection as much as the others in the range. Since the reprint market was in its infancy in the mid-Seventies I can only assume whoever compiled this collection and made the decision to remove some of the content did so without fully realising how passionate comic book readers are about their beloved stories. I don’t recall seeing this problem with other collections so I suspect Marvel learnt its lesson. This is still a good collection though and well worth tracking down if you’re as much a fan of vintage reprints as I am.